Beef is the largest driver of tropical deforestation—and companies that buy beef from tropical countries could be doing a lot more to stop it. 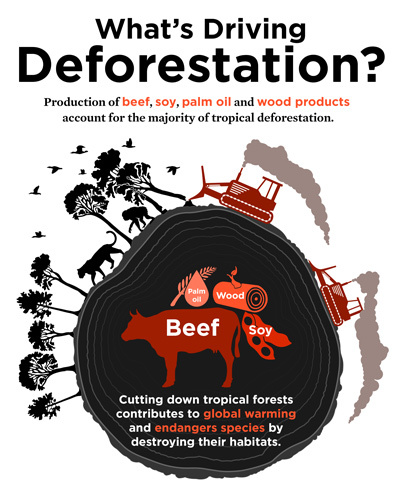 Tropical deforestation is responsible for about 10 percent of global warming emissions—and no product contributes more to tropical deforestation than beef. Each year, millions of hectares of forest are cleared for beef pasture, releasing carbon into the atmosphere and destroying habitat of endangered species. The deforestation impact of beef is greatest in South America, where beef was responsible for nearly three-quarters of total deforestation between 1990 and 2005. But beef can be produced without deforestation. A combination of industry agreements and government policies has begun to reduce beef's deforestation impact in the Brazilian Amazon. Though encouraging, these measures have been limited in scope, targeting only certain suppliers and regions. Truly deforestation-free supply chains will require more comprehensive policies and practices. Some companies have begun to take steps toward zero-deforestation beef. But none have gone far enough, and many have done little or nothing. Our 2016 report, Cattle, Cleared Forests, and Climate Change, scores the deforestation policies and practices of 13 fast food, retail, and manufacturing companies that have a presence in the US marketplace and also source beef from South America. Out of these 13 companies, four received zero points out of a possible 100, and six more received less than 30 points. Even the three companies that scored highest—Walmart, McDonalds, and Mars—fell well short of a "strong" rating. Just four commodities are responsible for the majority of tropical deforestation.